With the rental of any size storage unit at participating locations! Self storage can be hectic and stressful, so we here at Storage Partners wanted to take what we could off your shoulders. 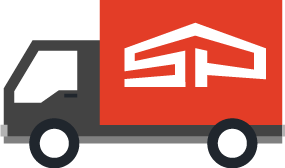 Rent with us, and we'll waive your truck rental fee to get your belongings into your unit. Plain and simple. For our storage locations without a company truck available, we have U-Haul trucks for rent. One stop shop for all your moving and storage needs. When you rent a storage space at a participating Storage Partners location, we'll waive the truck rental fee. When you see this icon below, that facility will have the free truck for your use. Feel free to call the facility to ask our professional and friendly managers any questions you may have. *Free rental is based on availability. If your address or other contact information has changed please update your information with your storage location. As an alternative, you are also able to update some of your contact information with accessing your online account at StoragePartners.